It was Mahatma Gandhi who said he admired Christ not Christians. I guess he said this to remind people that most Christians are definitely not Christ-like. One cannot claim to be a Christian when his attitude is opposite of the principle that we are called to live by. ‎There is no middle ground in this race. It is either you are living like Christ or you are a pretender. People like pretending to be what they are not. It is for this reason that one writer defined hypocrisy as a tribute that vice pays to virtue. There is absolutely nothing Christ-like in President Goodluck Jonathan’s administration. His policies are harsh towards the common man. He has done absolutely nothing for the poor of the land. Rather, he has done a lot to favour the rich and eminent personalities. Any true Christian knows that God loves the poor and is earnestly seeking to do them good. He is seriously looking for those to use to render service to the poor. It can only take a wicked man to increase the prices of petroleum products on a New Year day thereby causing immense hardship to numerous poverty stricken citizens. Any government that is anti poor is anti God. Jonathan has refused to go after those who are squandering our patrimony. Corruption is rampant and he is pretending that all is well. You cannot be a follower of Christ and allow evil to run rampant around you. How long can we continue this dance of death? How long are we going to allow these men from the forest of thousand demons to continue to desecrate our land? It is about time we chased them away. We need discipline and decorum in governance. And that is what Muhammadu Buhari is about. Buhari is everything that Jonathan is not. He is disciplined, painstaking and has a visceral dislike for corruption. He has promised to confront corruption and he is just about the only politician that has the credential to do that. He has done it before and he will do it again. The man cares passionately for the poor of the land and wants to do his bit to help them. Buhari is not a drunk and he is not in the business of running around with other people’s wives. As a Head of State, 11 out of 19 Ministers appointed by him were Christians. Buhari showed leadership when a dangerous Islamic sect known as Maitatsine threatened our peace. He refused to register Nigeria as a member of the Organization of Islamic Countries and banned government sponsorship of pilgrimages to Mecca. It is a well- known fact that his personal aides and domestic workers are mostly Christians and under him no one was victimized on the basis of religion. It is on record that Jonathan is the first President to lead Nigerian delegation to the Organization of Islamic Countries in February 2013. He has spent an average of $14 billion on 26, 000 Haji pilgrims annually from 2010. 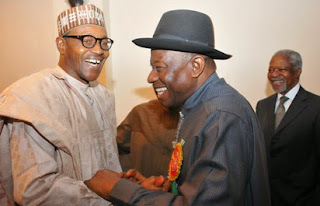 From all ramifications, Buhari has more Christian qualities than Jonathan. Buhari’s government will focus on building a society that would begin to move the powers of a smothering federal government back to states and local government. Government will be closer to the people and better aware of their real needs and wants. APC as party is open and beckoning to a majority of Nigerians not because we are handing out goodies to people but because we have a better proposal for them and their families. As a transformational leader, Buhari is sure of what he wants happen and is extraordinarily strong-willed about it. He has one thing in mind instead of a variety of passing impulses. He wants a society full of opportunities. In short, the key to a successful transformational leader is to keep your eyes focused on your goals. And the people’s general has a knack for ignoring unproductive criticism and feels neither threatened nor moved by it. He is not one of such politicians that display so much pettiness and hostility that is simply not productive. Surely, Nigeria will be better under him. PreviousDavid Beckham tops celebrity role models of children list. US disappointed over postponement of Nigeria’s general elections. Chelsea team doctor, Eva Carneiro quits Stamford Bridge.